Tshechu is a religious festival meaning “tenth day” held annually in various temples, monasteries and dzongs throughout the country. 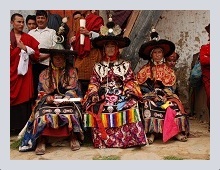 The tentative yearly festival calendar for the year 2013 and 2014 has been released with over 30 exciting festivals in various regions across Bhutan. Please click the following link to download 2015 Festival Dates | 2016 Festival Dates tentative festival calendar.